Townhome for sale Manila Best Breakfast (Pancakes) in Guam. Guam Breakfast (Pancakes). Guam restaurants, Its too bad Guam doesn’t have IHOP (International House Of Pancakes), but who needs one when you have Hafa Adai Cafe?! There’s nothing better than a local mom and pop’s breakfast deluxe. Looking for another joint to have your Guam Breakfast Pancake? 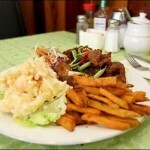 Visit hotguam.com under Food and Restaurant listings. There you will see the five star rated Guam Breakfast Pancake Restaurants and you can check the restaurant’s affordability too. I highly suggest you take a look at the costumer reviews and see if this will help you decide. I helped me a whole lot, specially when I read about items other people order on the men and what they like about it. My personal favorite Guam Breakfast Restaurant is no other than Shirley’s Restaurant on Harmon. They also have two other locations in Tamuning and Agana, but the one in Harmon is much closer to my home and nobody beats the costumer service since I’m there almost every morning. The other restaurant I love ordering my pancake is at Denny’s. They not only they have the yummy, fluffy, buttermilk pancake smothered in butter and maple syrup, they also have my all time favorite crepe. I love my crepe prepared with a dash of powdered sugar, nutella, fresh fruits, and honey.